Blog » Do you know which bin to use for family waste? Do you know which bin to use for family waste? The Waste & Recycling Team at East Riding of Yorkshire Council got in touch recently to ask if I could help raise awareness of a problem that I was previously unaware we have – nappies are being put in the recycling bin and causing issues for the recycling team. It’s a problem for Hull City Council as well as the East Riding and something I’d like to help raise awareness of across our region. I’ve always been an avid recycler and I get really passionate about trying to do our bit for the planet whenever I can. I rinse out all my jars and pots before going in the recycling bin and my husband knows about it if he forgets! I use the recycling wheel the council provided to see what goes in each bin; we recently got 2 new baby bunnies and I even got the recycling wheel out for their first cleanout to see which bin the cage sweepings went in (loose in the brown bun was the answer!). I just assumed that all of the recyclable materials I put into my recycling bin ended up being sorted and sent to the right places to be recycled into new materials. So I was shocked to hear that when some recycling bins are being emptied by the bin collection crews they are finding nappies and other non-recyclable family waste in there. This not only causes an issue for that bin but has the potential for the whole load to be rejected. 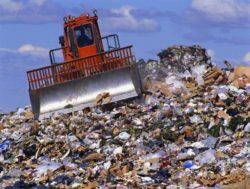 If my bin of recyclable materials ends up in a bin lorry with lots of bins of incorrect items in it could mean that the jars and pots I carefully washed out end up not getting recycled if they are part of a contaminated load. Although incorrect items are separated out when the blue bin material reaches the Material Recycling Facility, a heavily contaminated load may have to be sent as waste for energy recovery, and not for recycling. Nappies (and the plastic outer packaging), wipes (and the plastic packets wipes come in) should be placed into the general waste bin (green bin in the East Riding). They are not recyclable. Cotton wool, cotton buds and used tissues/kitchen roll should be placed into the general waste bin (green bin in the East Riding). They are not recyclable either. So why are nappies and other baby waste ending up in the recycling bin? When I had my first baby the amount of general waste we generated jumped up considerably. Suddenly there is so much non-recyclable baby waste, which then went up again when we had our 2nd child. If the general waste bin is full it’s hard to know what to do with the rest of the rubbish (we used to ask our kind neighbours who didn’t have kids if we could pop a bin bag in theirs if theirs wasn’t full!). We started making sure that everything that could be recycled definitely went in the recycling bin to make as much space as possible, and we took larger items direct to the Household Waste Recycling Site (or tip) where they can actually recycle more items than those collected by the bin collection crews, such as hard plastics. 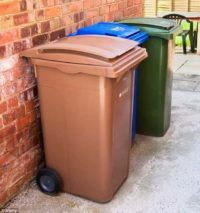 If you have a large, young family and need more help the East Riding of Yorkshire Council told me that any residents who feel they are struggling with their current bin capacity should contact (01482) 393939 or wastewatchers@eastriding.gov.uk for advice and help. East Riding residents are currently the top recyclers in the country (out of 380 authorities in England) at 65.4% of all household waste being recycled, which is fantastic. Let’s try to increase this even more by making sure the right waste is going in the right bin, to keep the blue bin material as clean as possible. You can find more information on their website here.